I'm afraid it's getting down to the point where I'm going to have to accept the fact that it's not practical to run errands in high heels all the time, especially on rainy wet NYC slippery streets and subways. The one pair of flats I purchased a few months back in an attempt to start my collection are only for sunny spring/summer days. Really, the only way I'd even give attention to any pair of flats would be if they were interesting, fun, stylish and practical. Gratefully, I've been seeing a whole array of pretty flats on the streets this year and it's making me look at these functional shoes not as boring but more like an accessory accent to my spring and summer wardrobe. A couple of days ago, I went in to Bloomingdale's to return something and ironically stumbled upon a pair of flats that just drew me in its direction (which happened to be from the Rachel Zoe collection). I'm happy to say I ended up buying them and can't stop staring and touching them. This brings me at my second pair of flats for this season. Woohoo! 1. I love these crystals on buckskin flats because they don't have that tong that cuts into my toes and they're blingy just as I like it. 3. 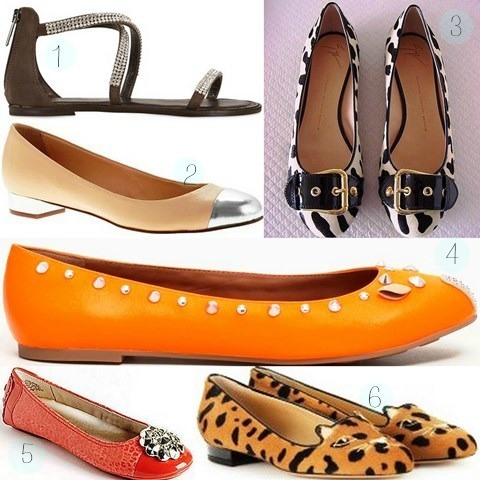 I find these Giuseppe Zanotti animal print ballet flats are to die for! 4. Having such a vibrant pair of these playful mouse motif shoes will ensure wearing flats all summer(well, maybe a little bit more than usual;). 5. And since these are no longer available...I'm thinking these or even these sassy ones would be good additions to a summer shoe wardrobe collection. 6. Now these kitty animal print flat loafers will be a conversation starter for sure. How fun are they?